Josh Neckels was named Executive Director of Eugene Ballet in July of 2016 after serving in the positions of Stage Manager, Tour Technical Director, Tour Manager, Finance Manager, Educational Outreach Coordinator, Company Manager and Production Manager for EBC since 1996. 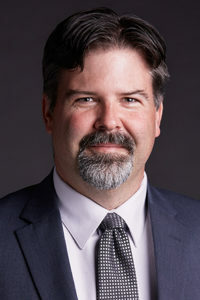 During those initial 19 seasons, Josh was an integral part of the Ballet’s successful collaborations with guest artists such as Curtis Salgado, Emerald City Jazz Kings, the Floydian Slips, and the Nowhere Band, as well as with other local arts groups, Eugene Concert Choir, Eugene Vocal Arts Ensemble, UO School of Music, Oregon Bach Festival, Oregon Mozart Players, The Shedd Institute for the Arts, and Chamber Music Amici. In addition to his work with EBC, Josh has had a significant impact on many of the other local performing arts organizations in Eugene. Serving two seasons as Production and Finance Manager at The Shedd Institute for the Arts, as well as seven summers as the Production Manager for their Oregon Festival of American Music. He spent two seasons as Stage Manager for the Willamette Repertory Theatre, eight seasons working for Eugene Opera as their Production Manager and Bookkeeper, and five summers working as Technical Director and Tour Stage Manager for the Oregon Bach Festival. Josh served as Production Coordinator for the City of Eugene’s Hult Center 25th Anniversary Celebration and the Britt Festival’s Crater Lake Project celebrating the centennial of the National Parks Service. Josh is a graduate of the University of Oregon’s College of Arts and Sciences. When he’s not at the Ballet he enjoys being a father to three great kids and spending time taking in all that Oregon has to offer.